Here is a video of the many people queueing in Covent Garden to buy the iPhone5. You will hear cheers from the Apple employees when one new customer is allowed to enter the store. There are still many bugs and disappointments related to the operating system iOS6 though. One problem is that when clicking on “passport” iOS6 says that it “Cannot connect to itunes store” even though you can actually connect later by clicking on any of the menu options. This may be (and it is a guess) that the actual apps are not ready yet. The revenge of the Tube: Going digital in a world of apps and maps. 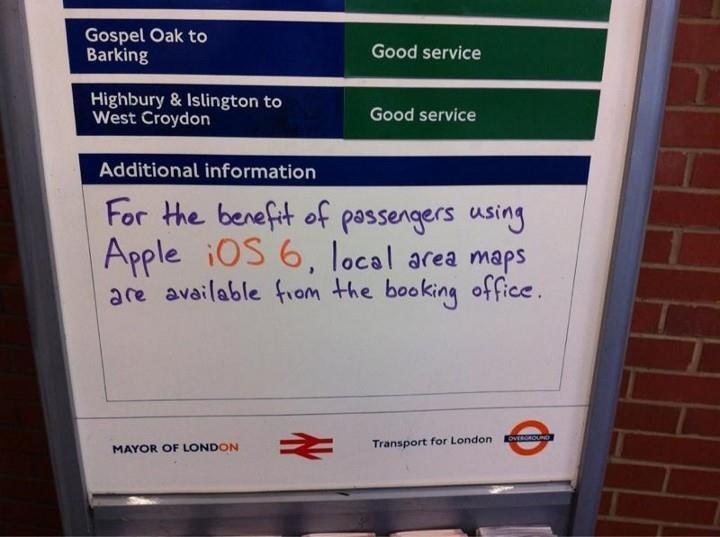 As for the new Apple map application, its problems inspired this comment from the people at London Underground. This entry was posted in Technology and tagged how do i get ios6, ios6 google maps, ios6 map, ios6 maps problem, ios6 passport, ios6 problems, iphone5, iphone5 covent garden, iphone5 line, iphone5 passport, iphone5 queue, iphone5 specs, iphone5 wait, iphone5 youtube. Bookmark the permalink.